Each year, millions of food drives are run to support more than 50,000 food pantries, soup kitchens, shelters and other organizations in the United States. And many of these food drives are held by companies as a way to engage employees in their workplace giving programs. But how much are those food drives really helping and are we running them as well as we could be? In a traditional company food drive, employees bring a handful of non-perishable food items to work and drop those items into a collection box. Each morning the box fills up a little bit more, until the employee who has volunteered to coordinate the event loads all the food into his/her vehicle and delivers the food donations to the organization which the company has chosen to support. Once the food drive is over, a company email goes out reporting how many pounds of food were donated and everyone feels good about what they’ve accomplished together. Sound about right? This traditional way of running a food drive is perfectly fine, and it does make you feel good to see the box of food get fuller each day when you enter the office. But, there is a new and better way to do it now. A new company, Amp Your Good, has developed a pioneering Crowd-feeding platform that enables people and organizations to Amplify their impact in the fight against hunger by raising fresh produce and other healthy food via online food drives (that’s right volunteer coordinators– no more heavy lifting for you). Here to share with us more about this Crowd-feeding platform and why this method of collecting food is critical to those receiving the food donations, is Amp Your Good CEO and Founder, Patrick O’Neill. America’s Charities: When did you start Amp Your Good and why? Patrick: We launched the Amp platform in June 2014. Hunger is a major social issue, affecting more than 50 Million people in the US. Food drives are an important source of help to those affected by food insecurity and a great way to rally a community for a common cause. We wanted to provide a way to make it easier to organize food drives and to make it simple and convenient to donate to them. America’s Charities: How does Amp Your Good’s “virtual food drive” work? Patrick: Drives are hosted on our crowd-feeding platform the same way campaigns are hosted on crowd-funding sites like Kickstarter and Indiegogo. But instead of donating money, people who want to support a food drive do that by selecting and purchasing food items at our site to donate. When the drive is over, Amp delivers all of the food donated to it directly to the hunger organization supported by the drive. America’s Charities: A lot of companies we work with have several offices located throughout the country. How does your platform help those companies? Patrick: Our platform is a great way to connect employees spread out over different locations. Companies can organize one big food drive that all of their employees can participate in no matter where they are located. Everyone gets to participate in the common effort. We also have a contest feature in which drives can compete with each other. This is a great feature that can create some fun engagement with different office locations or teams competing against one another to see who can help the most. 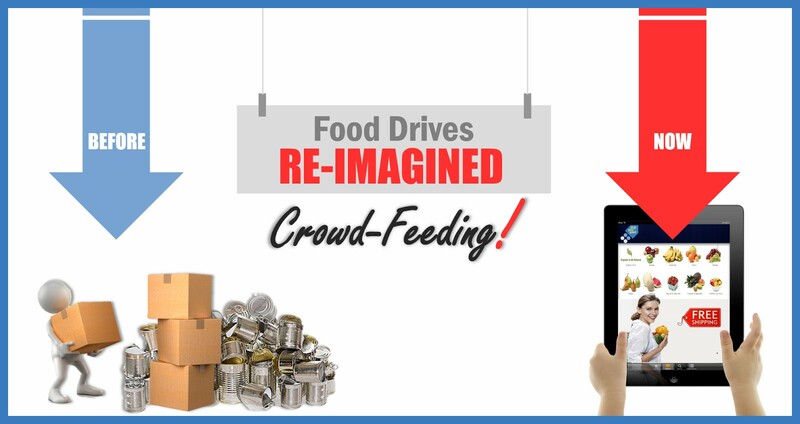 America’s Charities: Compared to traditional food drives, how does your Crowd-feeding platform help charities? Patrick: Our platform ensures that charities receive the food they most need through our registry tool. We collect data from hunger organizations so that the only food items people can purchase to donate match the organization’s need. One of the pitfalls of traditional drives is that oftentimes some of the donated food isn’t able to be used by the hunger organization. We also eliminate all of the sorting and inspecting charities need to do when they receive food from a traditional drive. America’s Charities: Traditional food drives typically limit people to donating non-perishable food items. Your platform allows people to donate fresh produce and other healthy food. Why is this so important to the people receiving the food donations? Patrick: Most people contending with food insecurity have very limited access to fresh produce and higher quality food. A recent Feeding America report stated that the #1 coping mechanism for those facing food insecurity is to buy cheap, unhealthy food. Providing these people with access to healthy food is critical and will help improve the health issues related to a poor diet - obesity, diabetes and heart disease. America’s Charities: You’ve recently partnered with FoodDay.org and on October 24th, you are launching a campaign called, “An Apple A Day”. Can you tell us about that and share how companies can participate? Patrick: The Food Day movement is designed to inspire Americans to change their diets and our food policies. Our ambition for Crowd-feeding is to inspire people to change how they think about what they can accomplish with food drives. We want to turn the billions of canned goods donated to food drives each year into billions of apples, bananas, carrots, sweet potatoes and other healthy food items. Our partnership with FoodDay.org and the An Apple A Day campaign is designed to create awareness of these goals and to hopefully produce many healthy food donations. Companies can participate by running an online food drive on our platform as part of the campaign anytime while the campaign is ongoing (it ends on #GivingTuesday, 12/2/14). Our thanks to Pat for talking with us about the Amp Your Good platform and their upcoming “An Apple A Day” campaign. To learn more about Patrick and his organization’s work, visit their website at http://www.ampyourgood.net . To reach Pat, email Patrick.ONeill@AmpYourGood.com or tweet him@poneill1982.